Our pilgrim goal: To experience the literal and figurative foundation of the cathedral. We are going to process through the crypt and pray at various stations along the way to understand it with our minds and bodies. We are entering the crypt from the north, or dark side. We will make our way through the longest crypt in France and will emerge on the south, the side of light and warmth. 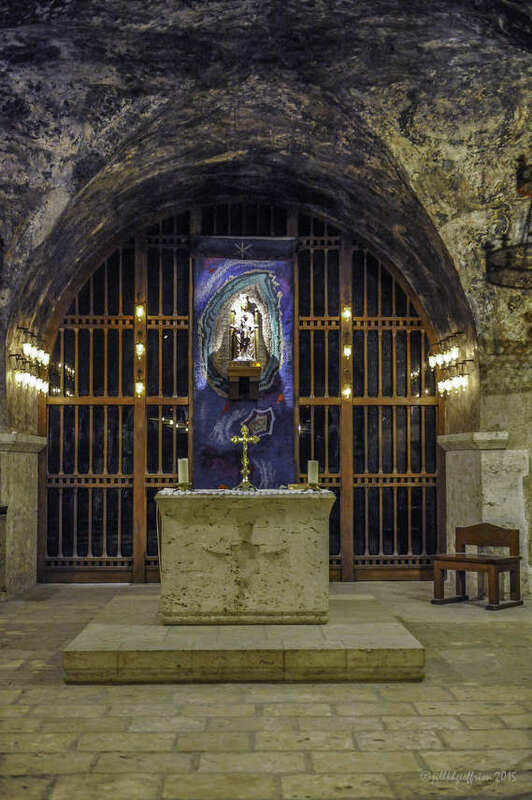 Our pilgrimage through the crypt is a symbolic reenactment of the Exodus journey of God’s people who traversed the desert and finally arrive in the Holy Land. Like our spiritual forbearers, we will stop and receive whatever manna God provides along the way. While many think of crypts as places of burial, there are no graves in this cathedral with its emphasis on life. Still, as we descend into the earth, a place where seeds grow in the dark, we may sense a spiritual connection of Jesus’ tomb and the catacombs of Rome where early Christians met to pray. 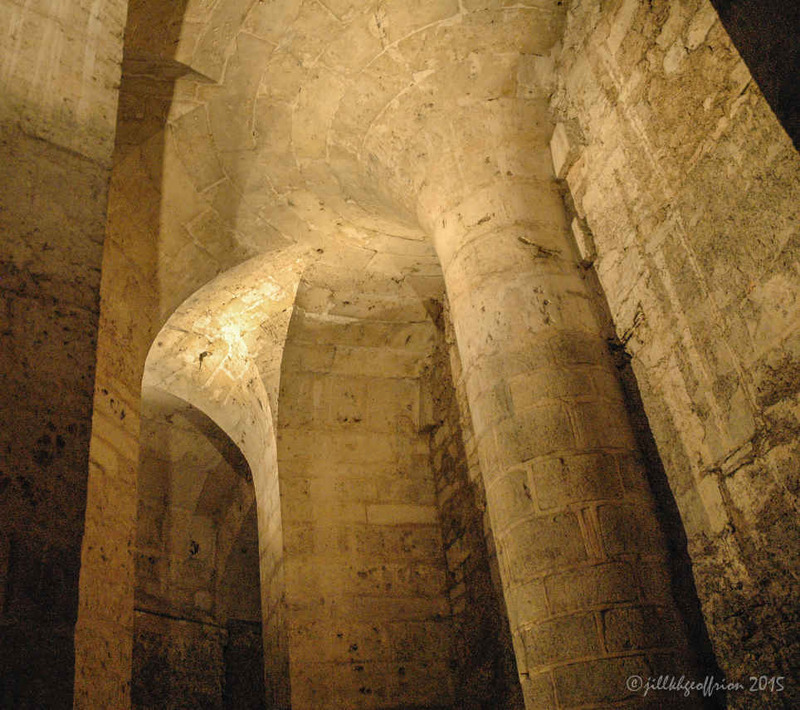 As you move through the crypt, following in the footsteps of countless pilgrims before you, allow yourself to let go of whatever you no longer need, making more space for God. One to two minutes for silent prayer and meditation. Procession song: Ubi caritas et amor, ubi caritas Deus obi est. Translation: Where true charity (charitable acts) and love are, God is there. Introduction: Take a moment to sense where you are. Breathe the air in deeply. Become aware of your skin sensing this place. Let your eyes adjust. Notice what you are hearing (from above or outside). This crypt is built in the form of a large “U” with two arms that are joined by a series of seven chapels in the East. It was constructed for pilgrim processions, like ours today. 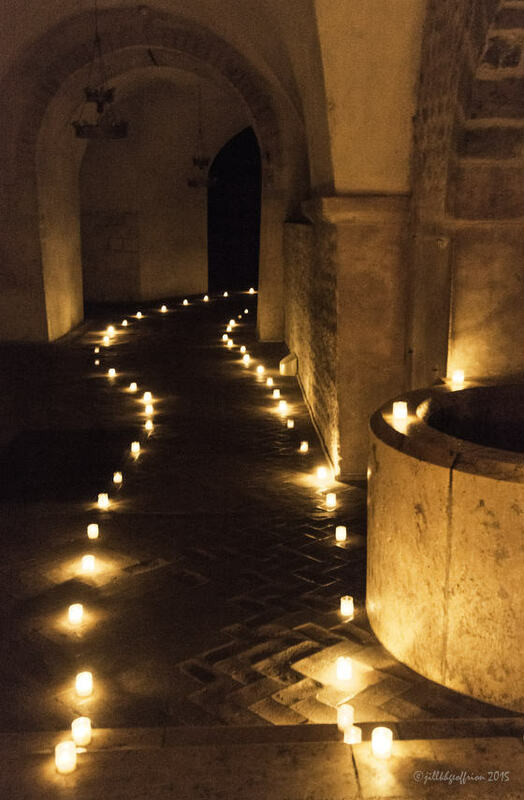 In the middle ages, pilgrims would have entered the crypt by the door and stairway behind us and processed to the other side of the church as we are going to do. This in an area where sisters lived beginning at the end of the 12th century. They were here to care for pilgrims who couldn’t continue and/or those who came who were sick with Saint Anthony’s Fire (mal aux ardents), a toxic reaction from eating grain that was rotten. Imagine this area filled with the sounds and smells of medieval travelers too weak to continue. Some would be carried in the morning to lay by the well that we will soon visit. It is here, on the north side of the cathedral, the cold side, the dark side, the side that represented the story of the Hebrew people of God, the side where Mary is represented as the human being who spanned the time before and after the coming of God to this world in the person of Jesus, here in the north that we begin. The north can then represent the time of waiting and of dark fertility. Perhaps you can sense the earth here—there is a smell of it, but you can also see that we are mostly surrounded by earth. You could say that we are, “under the earth”—which is the name of this immense chapel (The Chapel of our Lady Under the Earth–Notre Dame Sous Terre Chapel). Silent prayer and meditation (five minutes). 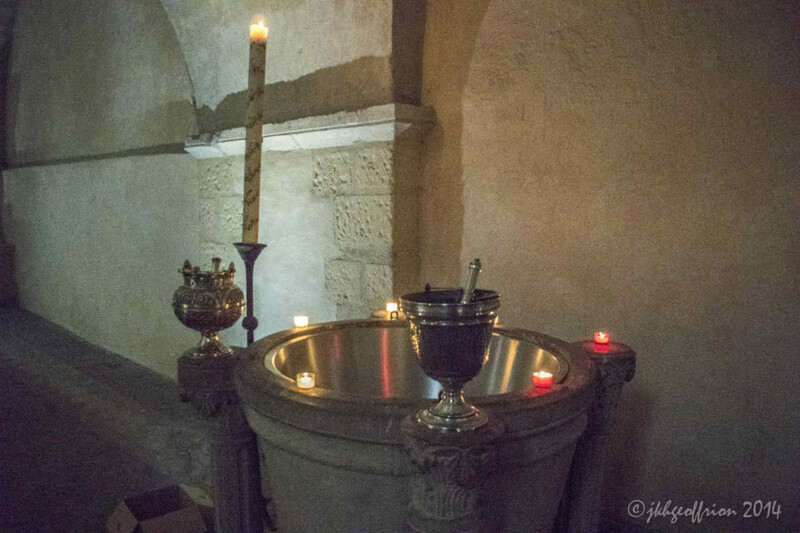 Introduction: We are now in the spiritual heart of the crypt, the Chapel of Our Lady Under the Earth. There are four particularly significant points of connection with Mary. The first is the 12th century mural of Mary, Throne of Wisdom (with a joyous Jesus), one of the oldest images of Mary here in the cathedral. To our right is the small piece of the Veil that stays in this chapel, except when it is occasionally taken out in the city as it has been during the procession for the Feast Day of the Assumption of Mary. 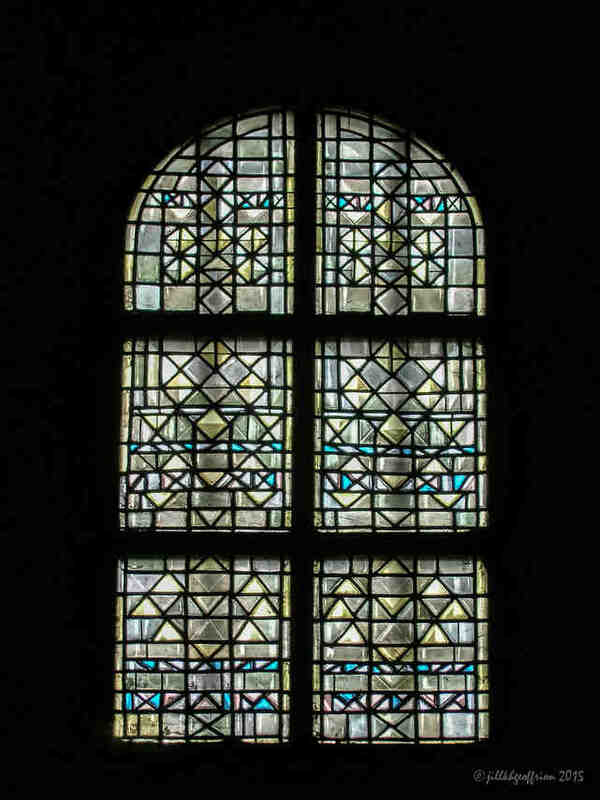 The most recently added stained glass window, added in 2010, Mary, Doorway to Heaven. And finally, the focal point of the chapel beyond the altar is the well-known statue of Notre Dame Sous Terre where Mary sits with her eyes closed and Jesus, with eyes open, blesses the world. This statue is a copy of a more ancient one destroyed during the Revolution at the end of the 18th century. It is not an exact replica, but was made using descriptions of the old statue. Invitation to prayer: Open your heart to God in the silence. Try to sense God’s love for YOU as it is being communicated in this place during these moments. Introduction: We are next to a well that is 98.5 feet (30 meters) deep. You can see that there is still water in it and that its base is square, as well bases were in ancient times. This well predates the Christian period. The distance to the Eure River below is roughly the same as the distance between the floor of the cathedral and the vault above. We are in an “in between” place. Water has many properties and functions; it is essential to life. Water is essential to the process of birth, and of course water is the symbol of spiritual rebirth.This well was considered holy because the first martyrs of the church in Chartres were said to have been thrown into it. Over the centuries, many miracles were reported to have taken place here. Ritual response: As you stand close to this ancient well, what longings for birth or rebirth do you sense in yourself? When you have identified one, I invite you to approach the well and symbolically to draw invisible water from it and use a gesture to share it with yourself. Invitation to prayer: Take a deep breath and notice particularly what you smell. If you need to, lean over the well and take another deep breath in. Ask yourself, how do the scents of this place invite me to pray? Let us pray. Transition: In the middle ages where we are now going was not accessible to pilgrims. The only entrance to this lower crypt was from a trap door in the choir. This was a place where most sacred objects of the church were kept. Introduction: We have arrived at the lowest and most ancient part of the cathedral. Bricks from a Roman wall are visible. Since the 9th century Christians have gathered here to celebrate and worship.We are directly below the high altar of the upper church. Take a moment to arrive. In 1194 the cathedral burnt down. What made the local people the most upset was the loss of the Veil of the Virgin. How surprised they were when after three days priests came up the stairway in the corner carrying the precious Veil. People believed that Mary had spared her tunic and they imagined that she wanted a grander and more glorious house built to house it, and so the Gothic Cathedral above us was built. Invitation to prayer: Enter the silence here with a sense of awe for the centuries of worship that have bathed this place. 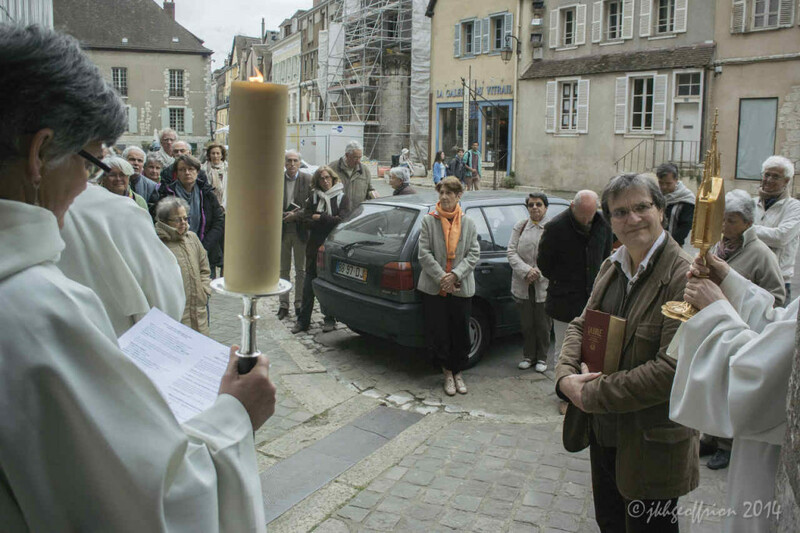 Thank God for all those of faith who have gone before us, and in whose footsteps and the echoes of their prayer we will be walking and living while in Chartres. Let us pray. 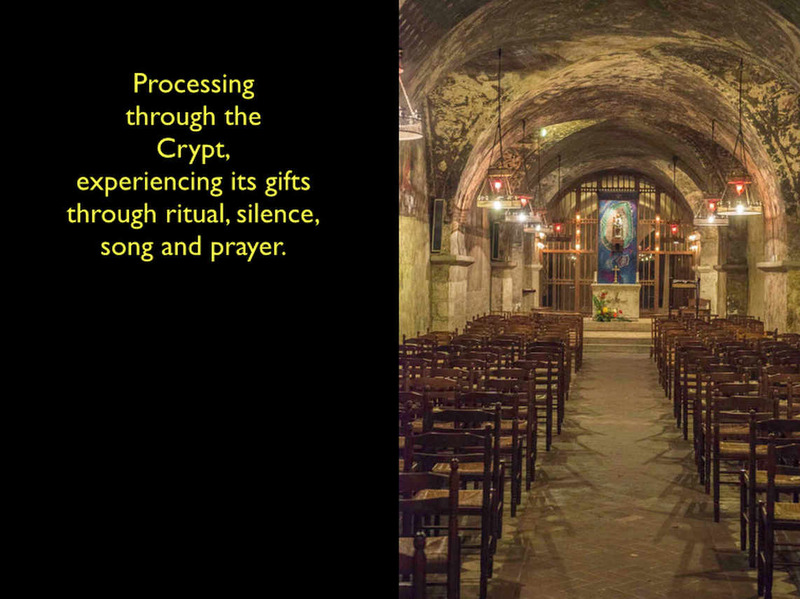 Let us silently process towards the baptistery that has been serving the congregations in Chartres for the past 800 years. Introduction: This twelfth-century fresco includes St. Clement, St. Nicolas, St. Marin, St. Peter, St. James the Greater, and St. Gilles celebrating mass before Charlemagne. It was restored in 1966. We began our procession in the north, in the shadows, in the place of expectant waiting–and now 656 feet/200 meters later we have arrived on the south side of the cathedral, the sunny side, at the ritual place of new birth. The Paschal candle, symbol both light and fire, is a reminder of God’s faithful journeying with God’s people, is nearby. Invitation to prayer: In this historic place of baptism, we can each remember the importance in our own lives of God’s mercy, and gift of new life. In the silence, remember your baptism and the meaning it has. Let us pray. Let us go forth embodying the love of God we have experienced in this place. Amen. 4th century: Gallo-roman wall, the first cathedral dates from this period. 6th century: Building of a Merovingian cathedral, some remains are under the choir. 8th century: In 743 the cathedral was destroyed by Hunald, duke of Aquitaine. Another cathedral is rebuilt in the same place. 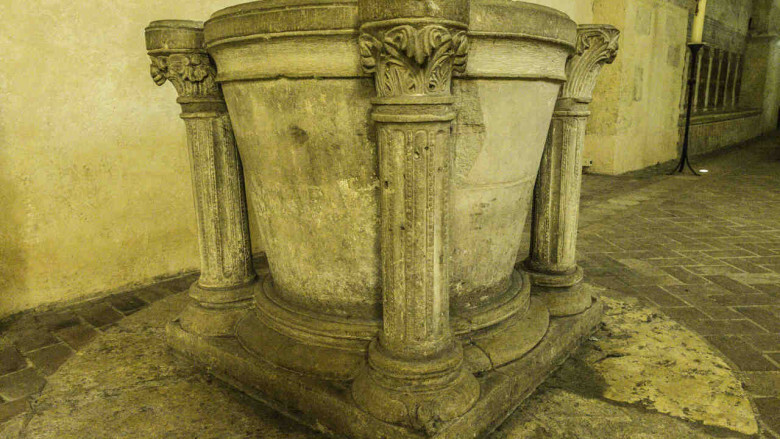 9th century: Carolingian crypt, called the St. Lubin crypt. 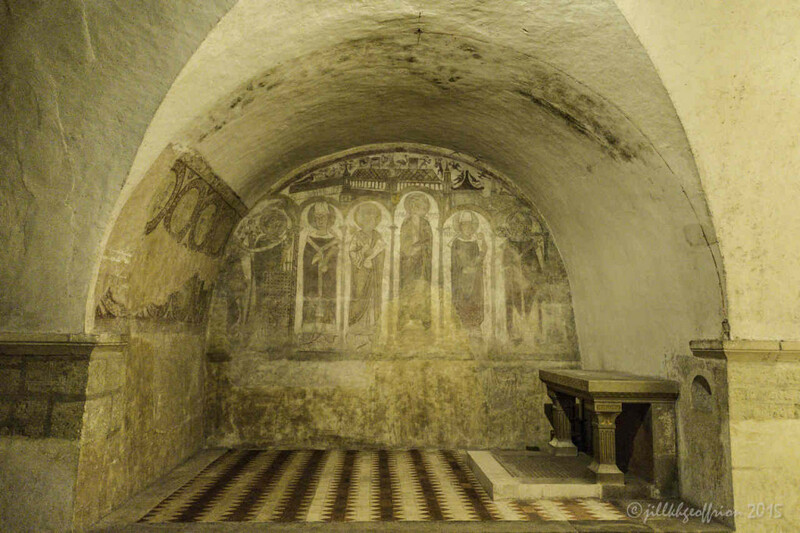 11th century: Romanesque crypt, called the St. Fulbert crypt. It is the longest in France (220 meters/722 feet). Fulbert taught at the famous Chartres Cathedral School, and became bishop in 1006. 12th century: 1194, Fire after which this cathedral was rebuilt on the remains of the earlier buildings. 13th century: Around 1230: Everything was in place. The cathedral was dedicated in 1260. 18th century: The crypt was closed during the Revolution (after Christmas 1790). The earlier version of Notre Dame Sous Terre was beheaded and burned. 19th century: The crypt was reopened in 1855. 20th century: A major restoration took place in 1976.